A gas stream composed of air and benzene enters a partial condenser (in which the vapor is only partially liquefied) at 100 °C and 1 atm. The temperatures of the liquid and gas outlet streams are computed in this Demonstration. In addition, the molar flow rates of benzene in the liquid and vapor streams exiting the partial condenser are determined. For this purpose, we make use of the energy balance equation for non-reactive systems: . 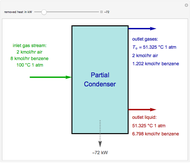 You can set the values of the heat removed by the partial condenser, . Additionally, we use the following relationship for benzene: . 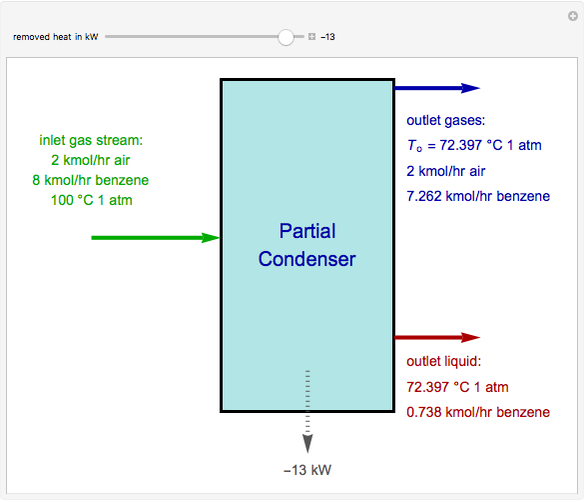 The specific enthalpies of air and benzene are computed using the temperature-dependent expressions of the constant-pressure heat capacities given in [1, Appendix B2]. In order to simplify the computation, we chose these reference states: air (gas) and benzene (vapor) both at 100 °C and 1atm. Thus, the term in the above energy balance equation is exactly equal to zero and can be dropped. It is straightforward to extend this calculation to other components. R. M. Felder and R. W. Rousseau, Elementary Principles of Chemical Processes, 3rd ed., New York: John Wiley & Sons, 2004. Housam Binous and Ahmed Bellagi "Operation of a Partial Condenser"